“We all go through experiences in life that leave us a changed person. I don’t think I had ever truly understood how essential it is to live your life with hope until I watched my younger sister, Maureen, during her two year battle with cancer. Hope gave her the courage to face life’s challenges and the belief that life holds wonderful possibilities. It kept her dreams alive and nourished her spirit. 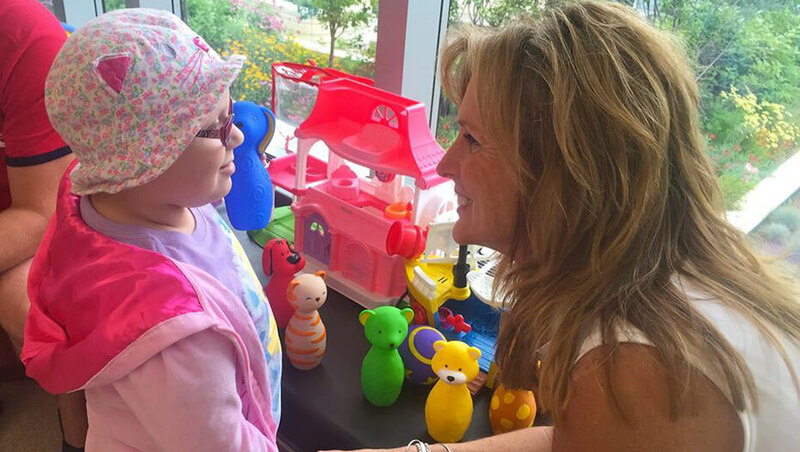 Maureen was blessed with hope and, though it exists for all of us, sometimes it must be found. Visit our jewelry store. All purchase proceeds benefit Maureen’s Hope Foundation. Be sure to check out our new line of sterling silver inspirational pieces! There are many needs that patients have when faced with a life altering disease that cannot be met by the medical community and we help to fulfill some of those needs. This program sponsored by Maureen’s Hope helps pediatric oncology and Cystic Fibrosis patients at Golisano Children’s Hospital to tell their story using colorful beads as symbols of courage that commemorate treatment milestones. Bears are given to children in the hospital to share with a parent or sibling during times they may have to be apart. Patients struggling with a life altering diagnosis are given a gift basket filled with items specific to their needs that bring comfort, hope, healing and inspiration. Maureen’s Hope takes approximately 30 moms that have children battling cancer, have children that have been cancer survivors for up to three years or have recently lost a child to cancer, to a spa for a day. It is a priceless day of connection and relaxation. People seem to remember patients in the hospital during the Christmas season, but what about the rest of the year? Since 2007, Maureen’s Hope has delivered 60 – 70 personalized baskets to Golisano Children’s Hospital that are placed in the rooms of hospitalized, sleeping children so they awake to a surprise on Easter Morning. Maureen’s Hope strives to make the journey easier for patients by providing small support services that can improve the quality of their lives. A wig, a lawn service, reiki or massage therapies are some examples of ways Maureen’s Hope has empowered patients. Join us and help make a difference today. Maureen’s Hope Foundation is a 501(c)3 non-profit organization and supported through personal and corporate donations, grants and fundraising events. Your support enables us to continue to fulfill our mission. The story behind our inspirational jewelry has made them a meaningful gift to share with someone special. Perhaps that someone is you! All proceeds benefit Maureen’s Hope Foundation. Learn more about the support we have provided to more than 1,500 families over the past ten years and consider sharing the gift of hope by contributing to one of our programs or services. Maureen’s Hope Foundation and Beads of Courage have partnered to offer you Carry A Bead kits to support patients locally. This program gives everyone an opportunity to actively get involved in the mission of Maureen’s Hope while supporting our programs. Approximately 80 active members serve people in our community facing the challenges of a cancer diagnosis or other life altering disease by raking leaves, decorating at Christmastime, making Hope Bracelets or whatever the need may be.